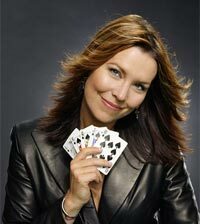 Annie Duke, formerly known as Anne LaBarr Lederer, was born in the US at Concord, New Hampshire on September 13, 1965. She studied at Columbia University, where she got her undergraduate degree in English and Psychology. She later on, 5 years into a master’s degree, quit college to start playing poker. Poker is not just her profession, it is also her brother’s, Howard Lederer. It was, in fact, her brother that helped and supported her when she started playing poker. She bounced around the US, first to Oregon to work for a poker software developer, and lastly to Los Angeles, California where she currently lives. With her poker stardom rising, she has been given several nicknames to go along with her style; “Annie Legend”, “The Duke”, and “The Duchess of Poker”. Annie Duke gained her poker experience from her brother, another professional poker player, and by playing in poker rooms where ever she went to live. She had participated in the World Series of Poker many times, but she was not able to leave with first place. It was in 2004 that her name blew up, getting her the fame and fortune that came along with being a champion. She initially got a reputation from training a famous actor, Ben Affleck, in how to play poker. Later on that year she went on to play in the World Series of Poker. During the WSOP, she managed to beat her brother in four different events, including the WSOP Tournament of Champions where she took first place and won the $2 million prize. During the same WSOP, she won her only bracelet so far, by winning the Omaha Hi/Lo tournament and earning $137,860. She has participated in several women’s only tournaments, however after some time she now refuses to play in these events. She says it is because poker is one sport where women can play against men on equal terms. Duke holds the women’s record for most money finishes at the WSOP, with a total of 38 times. She has also won more than $3 million in live tournament play. Another notable tournament she won was the 2010 National Heads-Up Poker Championship, where she managed to defeat a long list of difficult rivals, earn the title, and walk off with $500,000. Annie Duke is not only good at playing poker; she is also a prominent writer and speaker on all things poker-related. She wrote an autobiography, How I Raised, Folded, Bluffed, Flirted, Cursed, and Won Millions at The World Series of Poker. Until 2010, she was part of the UltimateBet team, where she was the spokesperson, would often write articles for, and played in sponsored events by the online poker site. During her time at UltimateBet, she was paired up with Phil Hellmuth Jr. and they both appeared as poker coaches on the TV show Best Damn Poker Show. She has also made appearances on other shows, including Poker After Dark, and was the first poker pro to be on The Colbert Show. Duke is also an avid philanthropist, playing in charity events, as well as organizing and raising funds for other charities, especially for Refugees International. She is a great poker player, writer and speaker, and best of all, a great mother of four. During her time playing in the World Series of Poker, she has won a bracelet and had 38 money finishes; ranking her at 32nd. During her time in the World Poker Tour she has been unable to win a title, but she has had four money finishes. Her total live tournament winnings as of 2010 were over $4,270,000. Annie Duke has been able to achieve great things, and will continue to do so for the foreseeable future.